Antonio's Restaurant is located in Tagaytay City which is a popular weekend destination and a short ride from Metro Manila. 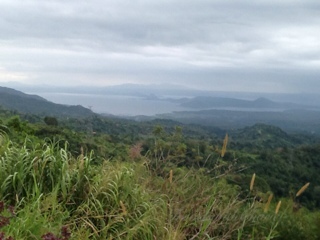 Taal Volcano rises from the waters of Taal Lake. It is one of the most active volcanoes in the Philippines. The second Antonio's restaurant (called Breakfast at Antonio's) has a commanding view of the lake and also serves lunch and dinner from the breakfast menu. This foyer impresses from the outset. Red paint on the walls provide a warm setting for the personal photos and antique "santos". This room evokes old world charm. The lower dining room is a spacious and elegant room, perfect for large parties. The black and white tiles spell classic!